As you know, I love everything to do with parties! For me, the planning process is almost as fun as the party itself. With every party I plan, my first step is always deciding on a theme. Once I’ve chosen the theme, the ideas just start pouring in. To choose the right party theme for your child, start to think about his/her interests. Do they have a favorite movie, a favorite place to play or a favorite character? Here are some questions to ask yourself when trying to come up with theme ideas for birthday parties. Does he have a favourite movie? You could theme your party around that movie or even go to the theatre for a private screening of the movie. Many theatres will let you bring in your own movie for a private screening party (during the less busy times of day). Does he have a favourite character? You could theme the party around the show or book they appear in. Planning a party theme around a character is really easy because you’ll have so many fun ideas to work with. Are there party entertainers in your area that dress up as this character? Think of the look on your child’s face if Spider-Man made a personal appearance at his party! Where does he like to go? Does he love the animals at the zoo? Does he always beg to go to the indoor playground? Check if these locations offer private party packages for kids. Most of these locations have many packages and ideas for birthday parties. Does he have a hobby? If your child likes to paint, you could arrange for a group lesson at a pottery painting studio. If your child likes crafts, contact your local craft store to see if they offer party lesson packages. Does he have a favourite animal? Your party decor, food and activities could represent this animal. For example, if your child loves dinosaurs you could have a Dino Buffet with two separate sides – one for the herbivores and one for the carnivores. Thinking of ideas for birthday parties is easy once you’ve settled on a theme. Does he have a favourite sport? Your party could be themed around this sport and maybe even held on a small sports field. One of the great things about a sport themed party is that it makes activity planning easy. Have you taken a family vacation that your child can’t stop talking about? You could recreate the destination (Hawaii, Disneyland, the beach, etc.) into a party theme. Does she have a favourite holiday (Easter, Christmas, etc.)? There’s no reason why you couldn’t have an egg hunt or gingerbread house making activity for a birthday party. What does your child want to be when he grows up? A firefighter? An astronaut? Their dream job could be a really fun party idea. I hope these theme ideas for birthday parties help you choose a fun theme for your child. What has been your favorite party theme to plan? Looking for more ideas for birthday parties and party planning inspiration? 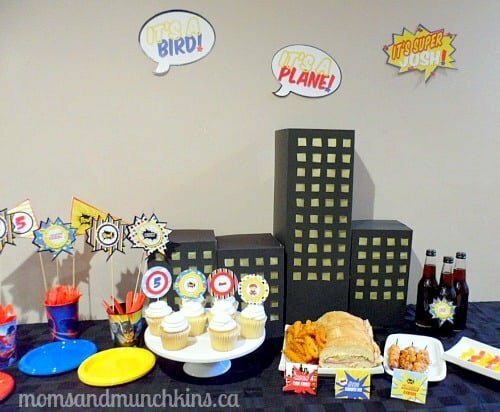 Check out our page of birthday party theme ideas. If you’re looking for adorable party supplies, check out one of my favorites – Birthday in a Box and save 10% off on all orders over $50 – Use code BDAY10 (a Moms & Munchkins affiliate code). We love a good party! We’re always adding creative new party ideas and we want to share them with you. Follow along on Facebook, Twitter, Pinterest and Bloglovin’. LOVE LOVE LOVE This post… I have a party I need to start planning for it is coming up in April and I plan on starting the planning next week. Wonderful tips! Great tips and ideas! My DD turned 5 recently and that was the age we said she could have chewing gum so of course she chose a Bubblegum theme. It was lots of fun. LOVE IT! I am trying to make one of those stupid Barbie Cakes this weekend. You know, the one you shove the legless Barbie into! p.s love the Dino idea for food! Love these ideas! Must bookmark this even though my kids are older! Where was this two days ago, I was struggling to decide for my son’s 1st birthday! lol Great tips! Great ideas! I always find it hard to decide on a theme for my kid’s parties.